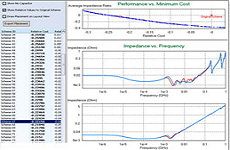 Signal integrity (SI) and power integrity (PI) problems are happening more often, when frequencies are getting higher and supply voltages are getting lower. FlowCAD offers with its experienced services team multiple ways to assist your design team. We can perform SI and PI simulations already during the design phase to enable a first time right developments. But when you have a prototype or product causing failures we offer a root cause analysis. With our network analyser (8753D Network Analyzer, 30 kHz to 6 GHz with time domain option) we can measure the behaviour of your design. With simulations we can model the design to match the measurements. Now you can perform changes in the design and see the improvements.